You all know about my love affair with Memebox. It fizzled out earlier this year when they stopped shipping worldwide and their boxes became lackluster compared to last year, but recently they've been stocking some pretty good stuff! 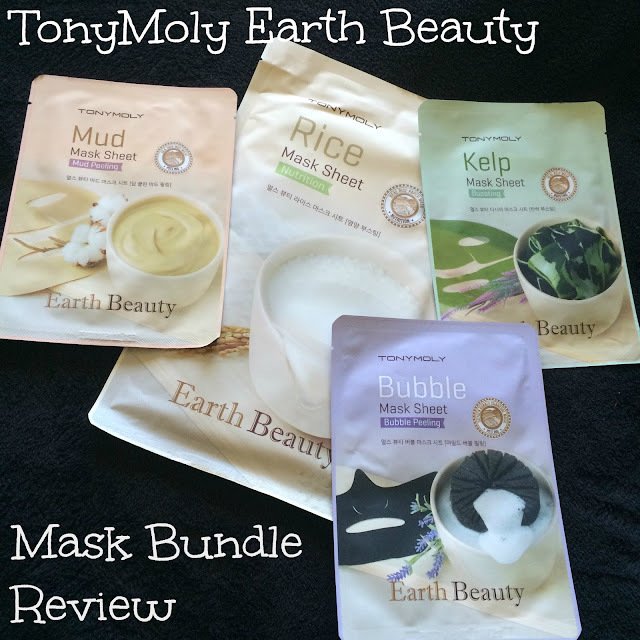 This Earth Beauty Mask Bundle from TonyMoly is something I've been looking at for a while, and was thrilled to see Memebox add it to their shop for $15 (affiliate link). Problems with huge pores, oily skin and dead skin cells? This mask derived from high quality mud extract is the ultimate solution for your troubled skin! 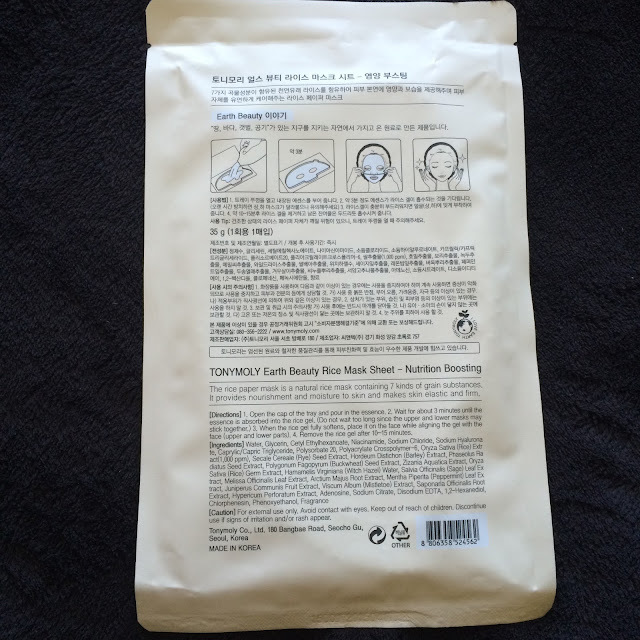 It washes away impurities by mildly peeling dead skin off and free your skin from roughness. With its mud clay content, it also controls the skin’s production of sebum to prevent oiliness and pimples from occurring. It deeply cleanses the skin to give your skin a much beautiful texture and a fairer complexion. 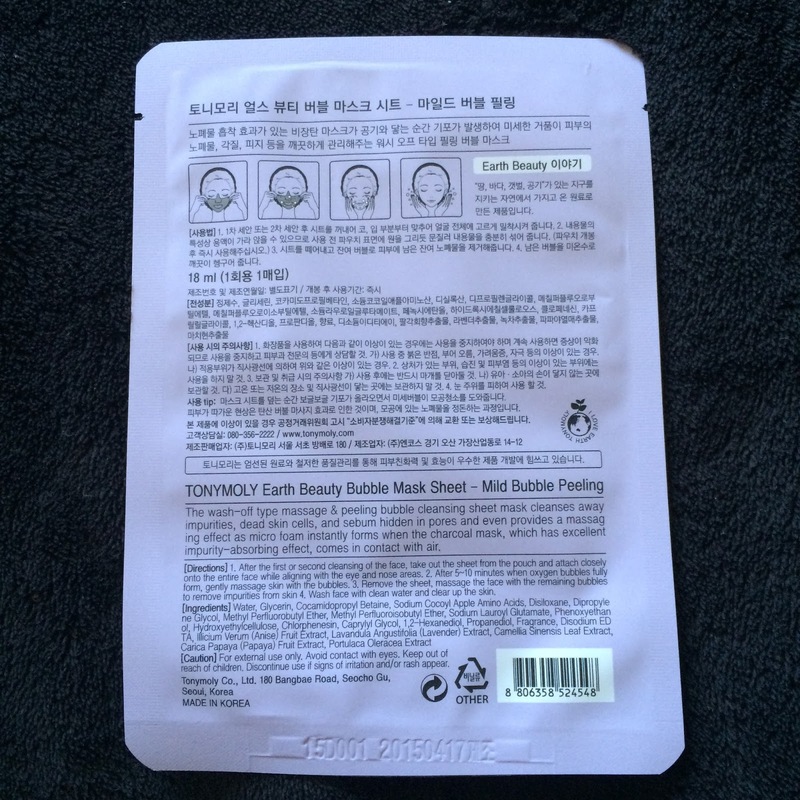 How to use: After cleansing and toning, carefully place the mask sheet onto your face and leave it for 15 to 20 minutes. After the allotted time, dispose the mask sheet properly and massage the remaining essence onto the face for better absorption. Usually mud and clay masks are super drying and too messy for me to want to deal with. I love the idea of a mud mask in the form of a sheet mask. 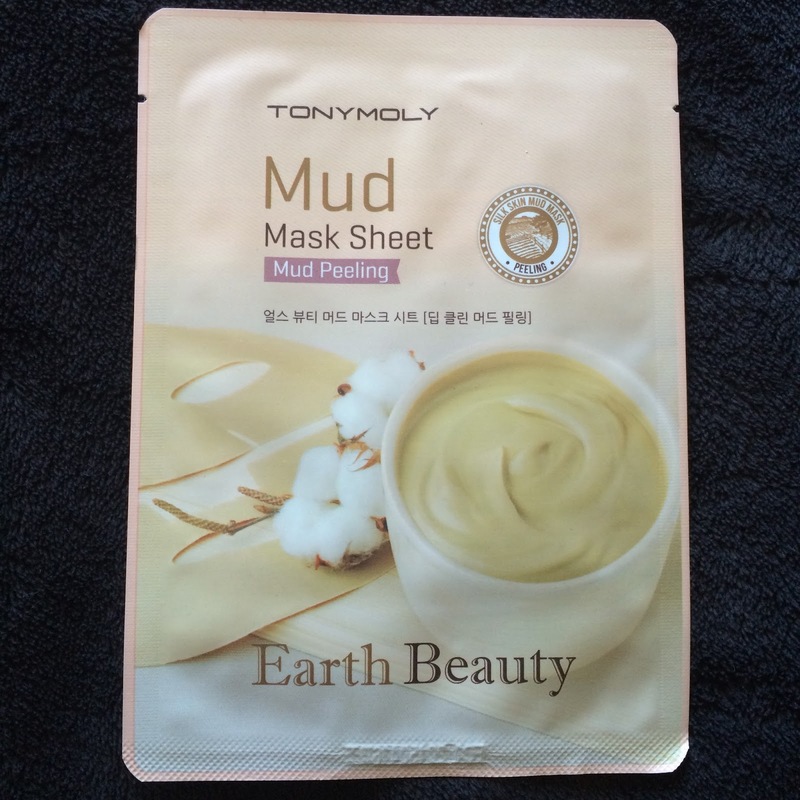 The mud dries and pulls impurities and excess oil from your skin, then you simply peel away the mask - easy peasy. This is a mask I could see myself using a lot in the summer when my skin is oily, breaking out like mad, and needs the extra help that mud masks can offer. Ingredients: Water (Aqua), Bentonite , Kaolin , Glycerin, Butylene Glycol , Clay (1,000 ppm), niacinamide, Betula Alba (birch sap) Juice, Chamomila Recutita (matricaria) Flower Extract , Hamamelis Virginiana (witch hazel) Extract, Portulaca Oleracea extract, Aloe Barbadenssis (aloe vera) leaf extract, xanthan gum , Volcanic Ash, Hydrolyzed Collagen, Allantoin, disodium EDTA, PEG-60 hydrogenated castor oil, red iron oxide (CI 77491), yellow iron oxide (CI 77492), black iron oxide (CI 77499), methylparaben, fragrance. Give your skin superior nourishment derived from the goodness of premium rice extract. Rich in antioxidants and known for its exceptional brightening properties, this mask sheet has organic rice as its main ingredient. This promotes brighter, smoother skin and fully nourishes it from within to put your skin at its best state. It also supplies a healthy amount of moisture to keep your skin looking glowy and healthy all day. How to use: After cleansing and toning, carefully place the mask sheet onto your face and leave it for 15-20 minutes. After the allotted time, dispose the mask sheet properly and massage the remaining essence onto the face for better absorption. 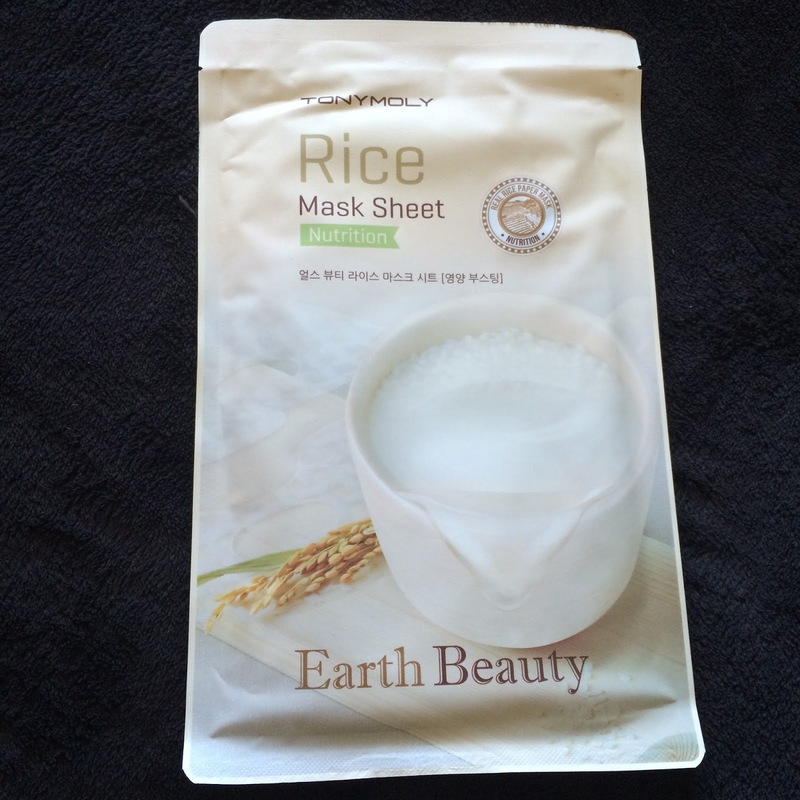 This mask is a bit tricky - you add the liquid to the rice paper, allow it to absorb for a bit, then gently apply it to your face. Make sure the separate the papers before pouring in the liquid, or they'll stick together! I think this is one of my favorites from the set. This mask is great for brightening and I also found it to be very hydrating. It will leave a residue on your face though - so be prepared to give your face a while to soak everything in, or to massage something thinner in over it to get it to absorb faster. Ingredients: Purified water , glycerin , cetyl ethylhexanoate, niacinamide, sodium chloride, Sodium hyaluronate, Caprylic/Capric Triglyceride , polysorbate 20 , polyacrylate crosspolymer-6, oryza sativa (rice) extract(1000ppm), secale cereale (rye) extract, hordeum distichone (barley) extract, phaseolus radiatus (mung bean) seed extract, polygonum fagopyrun (buckwheat) seed extract, zizania aquatica (wild rice) extract, oryza sativa(rice) germ extract, hamamelis virginiana (witch hazel) water, salvia officinalis (sage) leaf extract, melissa officinalis (lemon balm) leaf extract, arctium majus (burdock) root extract, mentha piperita (peppermint) leaf extract, juniperus commuis fruit extract, viscum album (mistletoe) extract, saponaria officinalis root extract, hypericum perforatum (St John’s wort) extract, adenosine, sodium citrate, disodium EDTA, 1,2-hexanediol , chlorphenesin, phenoxyethanol, fragrance. Get rid of dead skin and damaged cells that cause you rough skin! 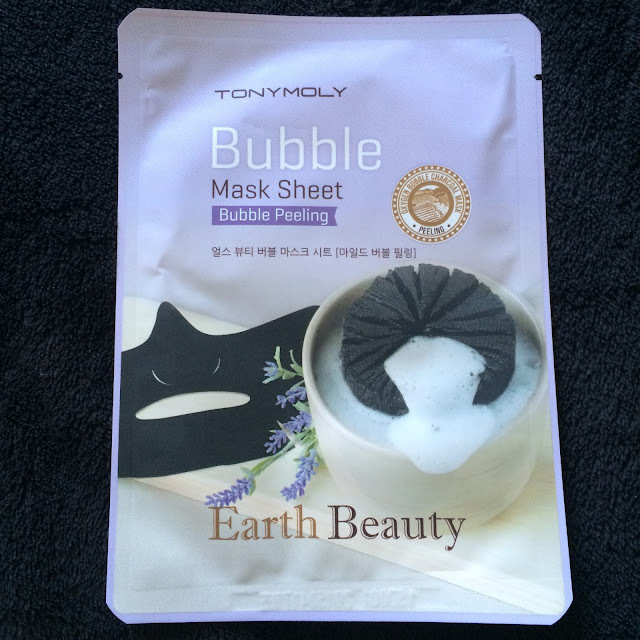 Tony Moly’s Earth Beauty Bubble Mask Sheet contains a rich blend of herbal ingredients fortified with oxygen bubbles that help eliminate dead skin completely. The fine bubbles produced by this mask washes away dirt and damaged cells in order to reveal a much healthier, softer and smoother skin layer. It also leaves a moisture film to protect your skin from damage. I've seen similar masks like this before, but I've never had the chance to try one. I love bubbling masks because they really help clean out my pores. This mask is extra bubbly - it starts up as soon as you open the package and it just keeps going. 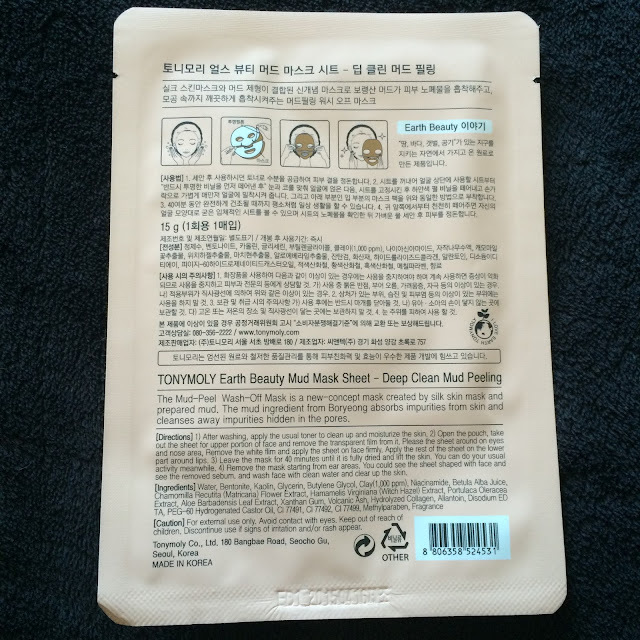 This mask did help clear my skin [NOTE: this mask is like a half mask, it only covers your nose, cheeks, and chin) but it dried out my skin too, and caused a small amount of irritation. Either this mask is very harsh or my skin is getting more sensitive as I age. 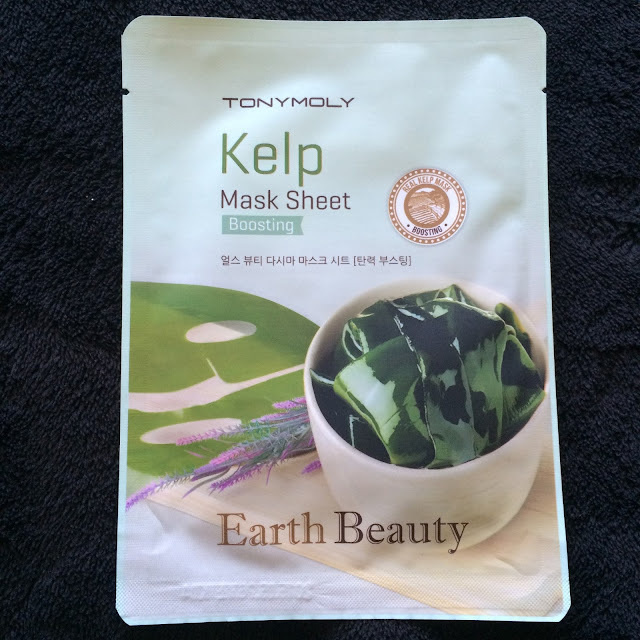 Experience plumper and younger-looking skin with this Kelp mask from Tony Moly. It contains 90.37% eco substances rich in marine nutrients which promote better skin elasticity. This helps the skin produce healthier skin cells and prevent formation of fine lines and wrinkles. Sea Kelp is also known for its numerous health benefits which keeps your skin’s condition healthy. It offers full moisture that lasts for 72 hours! I love this mask! 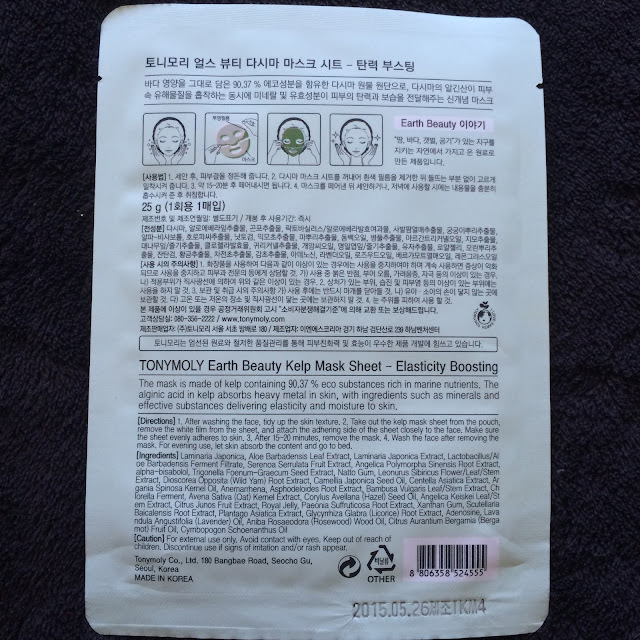 I got one in the August Mask Box (currently in stock if you're interested) and despite the fishy smell (it's made with real seaweed) and the slimy texture, this mask is very hydrating and manages to help make my skin appear more clear as well. I have a few of these in my stash and I'm hoarding them for when winter comes and the added moisture will really help my face a lot. This is a great value set, and the price is really a deal, considering each mask is $5 or more on its own. I hope Memebox continues to add great sets like this one! I would like to try the kelp mask. I actually have not heard of this company before. I am glad to hear that their products are picking back up.